Maryemana Evi is Turkish for Mary-the-mother's House. 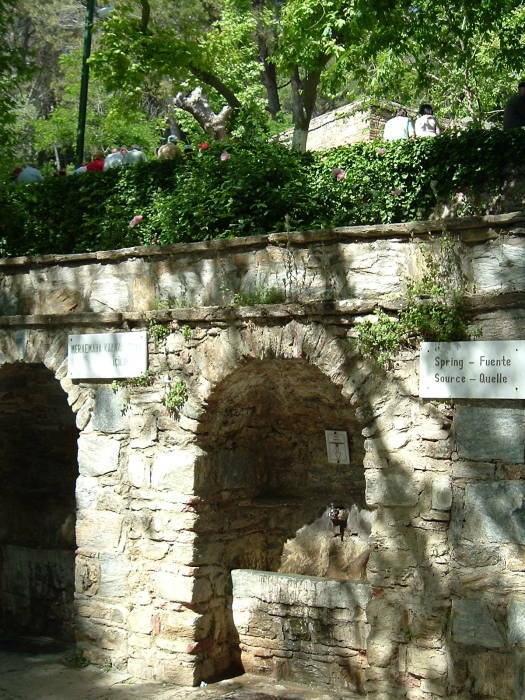 It is believed to be where Jesus' mother Mary lived from soon after the crucifixion and resurrection until she died. 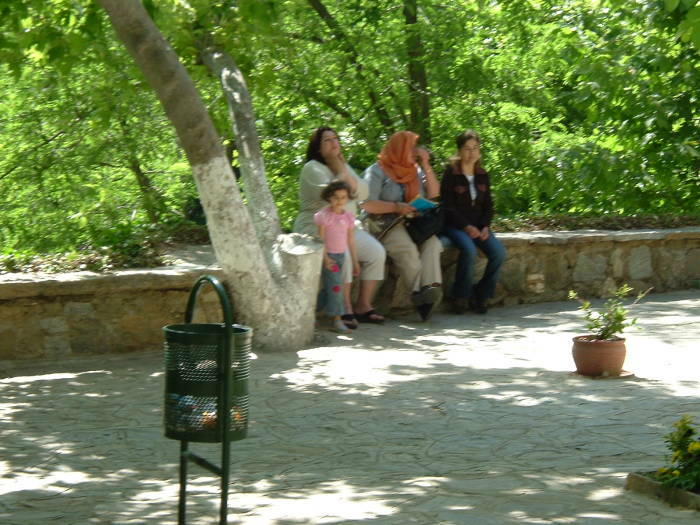 The site is an important pilgrimage destination for Christians and also for Muslims, who revere Mary as an especially holy woman and the mother of the second-greatest prophet. 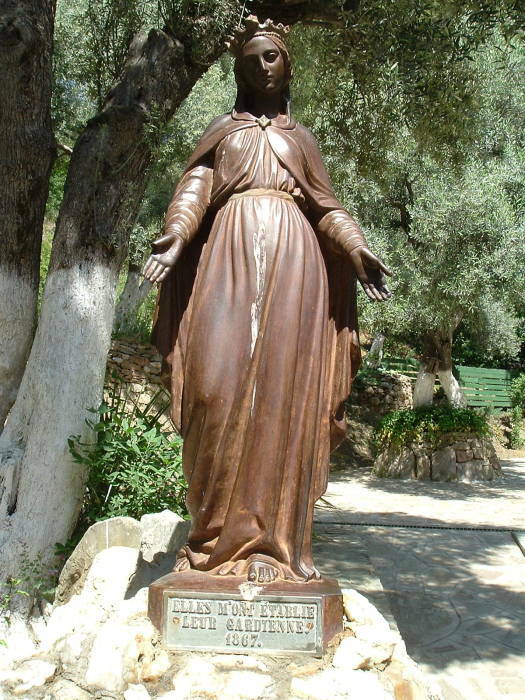 Mary is the only woman referred to by name in the Koran. Sura 19 of the Koran is titled Mary. There is a lot of evidence for John having moved to Ephesus almost immediately (so, soon after 30 CE) and spending the rest of his life in that region. This was about 2000 years ago — there weren't electronic funds transfers, telephones, or the other things you would need to live in Asia Minor and support someone living in Palestine. The Gospel writer Luke was a very well-educated Greek. He was trained as a physician, and he was a careful historical writer in the classic Greek tradition. He begins both his Gospel and The Acts of the Apostles with statements that his goal was to carefully collect information from as many eye-witnesses as possible in order to better create a historically accurate record. He definitely was in Ephesus on multiple occasions (see Acts). One interesting thing is that The Gospel of Luke is the only record of many details of Jesus' birth and personal life. Luke only became interested in the events years after the crucifixion, and so he had to learn these details from someone who had been very close to him. 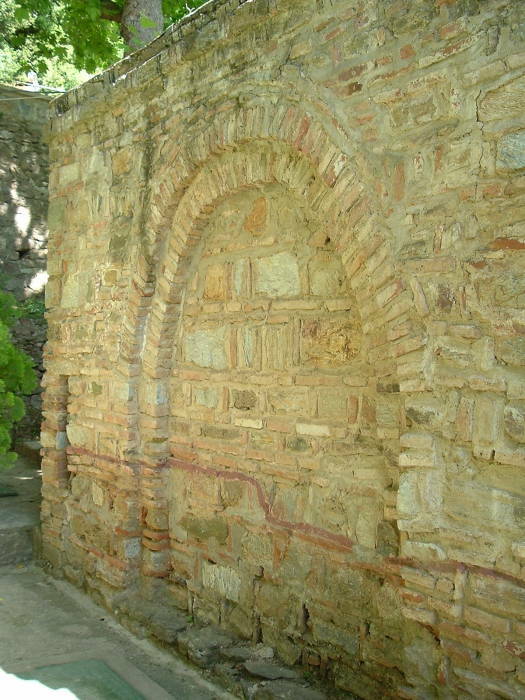 The main Christian church in Ephesus, built in the 300s and used for a long time, was titled the Basilica of the Virgin Mary. Church doctrine during that time required that a church called a "basilica" had to be named after someone who had lived in the immediate vicinity. 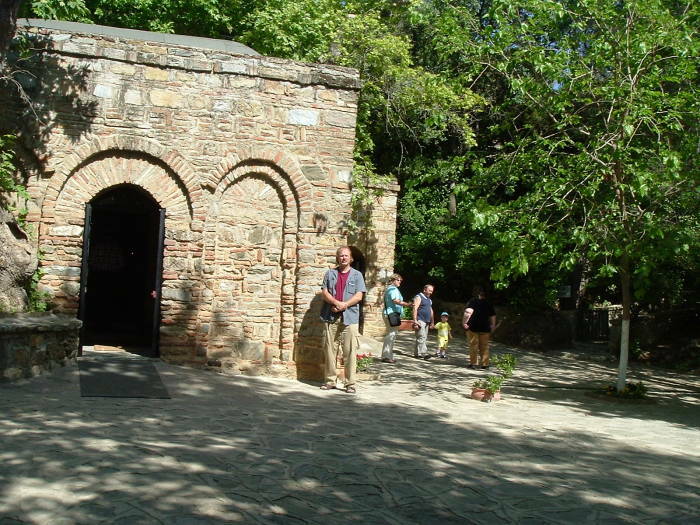 The site believed to be Mary's house is on a mountain about eight kilometers up a winding road from the city of Ephesus. A church with an extraordinarily large baptismal font has been excavated adjacent to the house site. That church structure dates to the 300s, and it is in an unusually remote location unless it was built there to commemorate something known at that time. 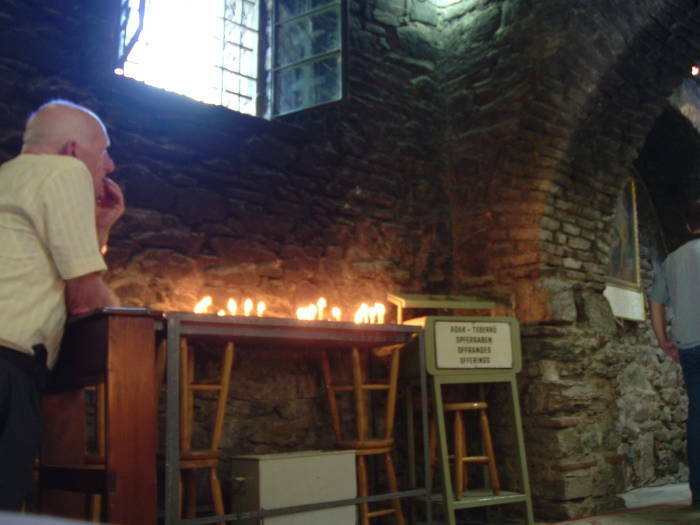 The Third Ecumenical Council took place in 431 in that basilica in Ephesus. Like most such church councils of that era, it was primarily aimed at stamping out what were seen as doctrinal heresies. However, unrelated to the main goal, it was also the council at which the title "Mother of God" was formally applied to Mary. The ecumenical council wrote about Nestorius, "....after his arrival in Ephesus, where lived John the Theologian and the Holy Virgin Mary, mother of God...."
Ephesus had been a major center for worship of an Asian mother-goddess figure. When the Greeks arrived they labeled this goddess as their Artemis, although the Asian goddess was really nothing at all like the Greek huntress goddess Artemis. The Temple of Artemis was said to contain a squat statue of the mother-goddess, carved from a meteorite. Even in the 400's there was still a fair amount of the "old-time religion" in the area. Some feel that the increased emphasis on Mary may have been done to include a comfortably familiar sacred mother figure and thereby make Christianity more attractive to the local people in what was then one of the top three cities in the empire. Defining this doctrine at this specific council suggests that it was then strongly believed that she had lived and died in the area. For details on possible connections from Mother Goddess to Mary, see Australian historian John Romer's Testament book and associated television series. Joseph Campbell's The Masks of God: Occidental Religions also discusses this. 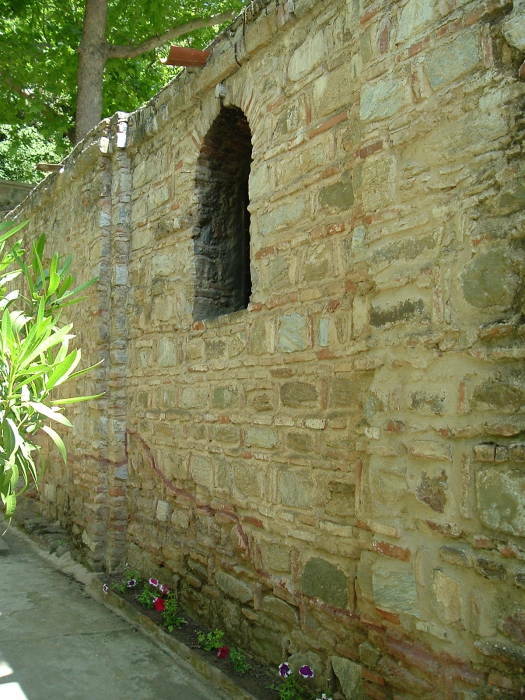 The villagers of Kirkindje were descendants of the early Christians of Ephesus. They lived in isolation from the Muslim government and society throughout the Ottoman Empire. 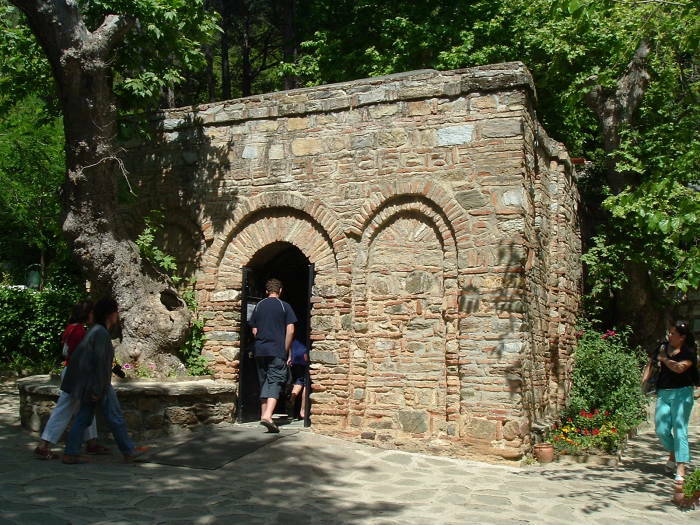 They maintained a tradition of Mary's death here in a place they call Panaghia Kapulu. In the 1800s a stigmatized invalid German nun named Anna Catherine Emmerich wrote down her visions of Mary's life. These included detailed descriptions of her home and its surroundings. By the way, Mel Gibson (Gallipoli, Mad Max, The Road Warrior, Mad Max Beyond Thunderdome, etc) is a devotee of Emmerich. He included some of her non-canonical (that is, not included in officially accepted writings) details in his movie The Passion of the Christ. In 1891 a French priest used Emmerich's writings to explore the area. He discovered what has since been identified as the ruins of a chapel from about 300 CE, built on top of an earlier structure. The theory is that Mary lived here, and by 300 a chapel had been built over her home. Sometime within the next century the larger church was built just about 100 meters away. For more on all this, see the University of Dayton site. 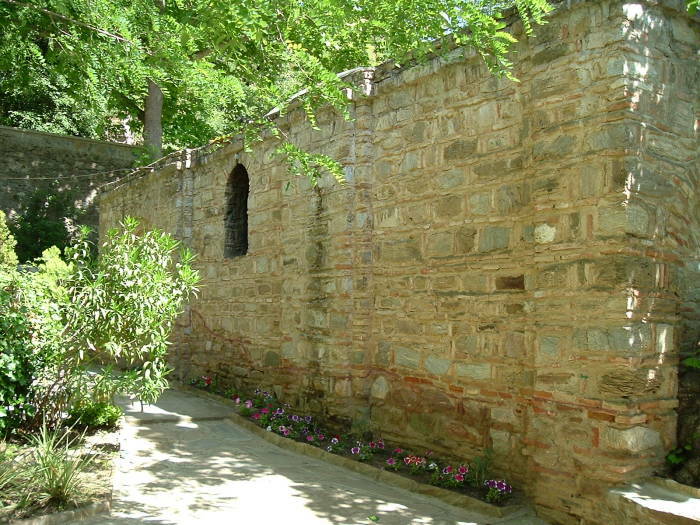 It's a reasonably short drive, 8 to 10 kilometers from Selçuk to Maryemana Evi. 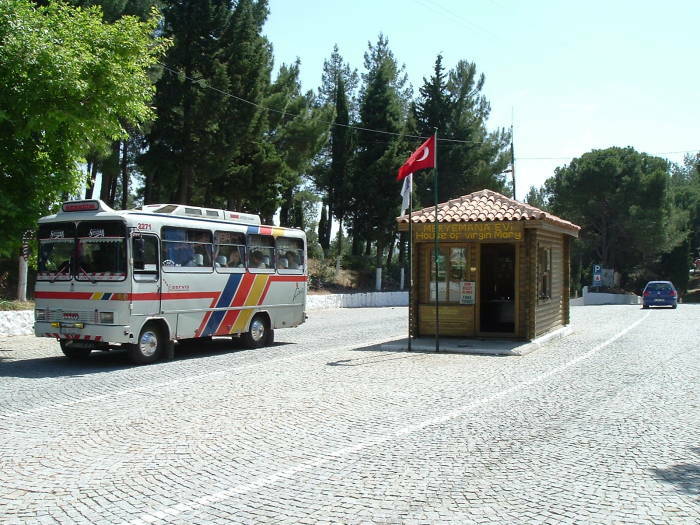 There is no public transportation (bus or dolmuş) to the house. You could hire a taxi, although make sure that you negotiate the amount of time you want to spend at the site. 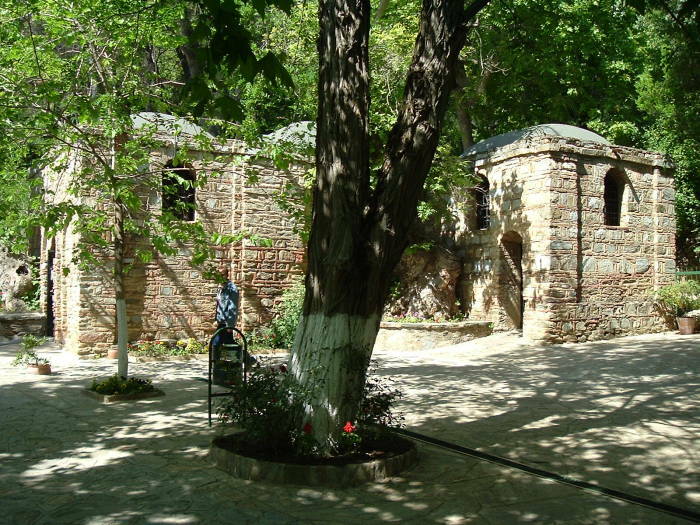 However, if you're ambitious and not afraid of a little exertion, it is a very interesting walk from Selçuk to Maryemana Evi! If you are going to walk, make sure to allow plenty of time. It will take you a few hours to get there, and after all that walking you will want to spend some time looking around (and resting a little!). You are going to cover 8 to 10 kilometers in each direction, ascending and then descending about 420 meters elevation. Make sure you are prepared, including plenty of water. You can refill your canteen or bottles from the spring at the side. Start by following my suggestions for walking from Selçuk to Ephesus. When you get to the Cave of the Seven Sleepers, continue in the same direction on that road. After a few hundred meters you come to a T intersection — turn to your right, toward the upper entrance to Ephesus. After that you can't get lost, as long as you follow the paved road! You will follow that road up Aladağ (Spotted Mountain). Unpaved forest roads branch off, but the paved road leads to the parking lot at the entrance to the house site. You quickly pass through changing conditions as you ascend. The fields around Selçuk are intensively farmed, and many are irrigated as the valley is somewhat dry. 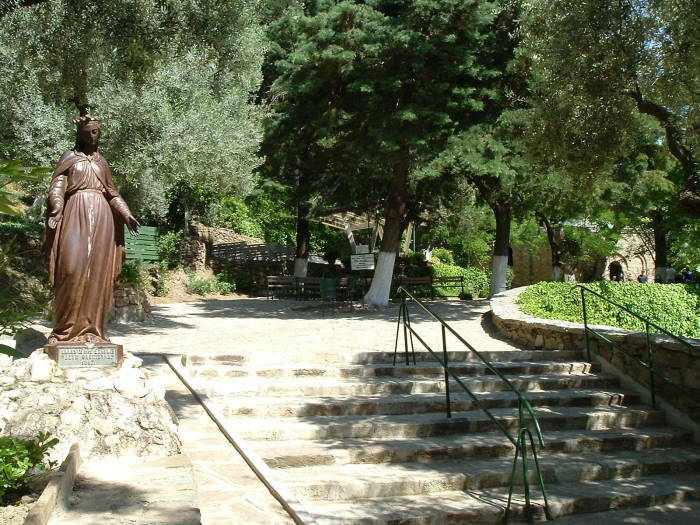 Just past the upper entrance to Ephesus you pass a large statue of Mary, and quickly enter the national forest area. 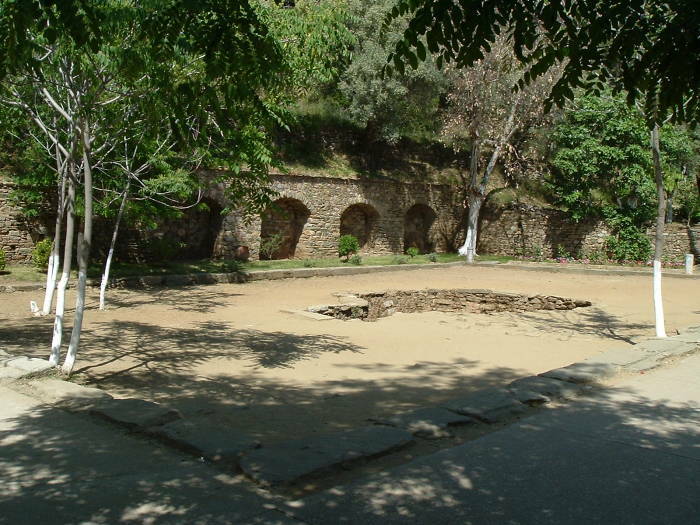 Watch for the ruins of the outer city walls of Ephesus, about where the road makes its first major turn after the statue, and is entering the forest. 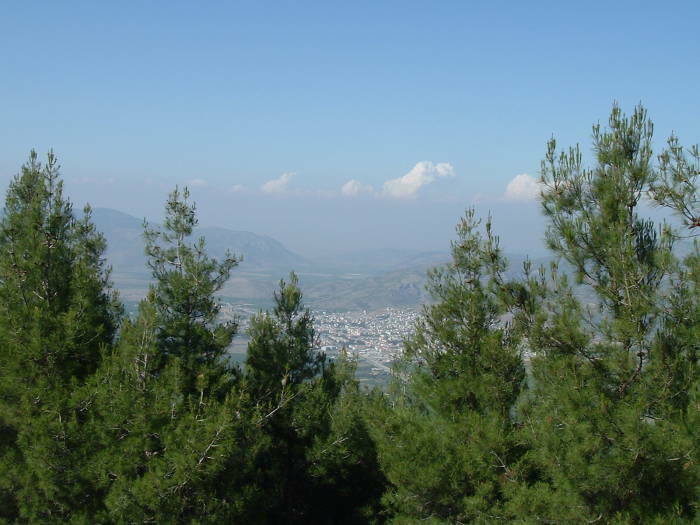 The southern outer city walls follow the ridgeline of the hill overlooking the city. You will go around that and continue up Aladağ. The higher you go, the cooler and moister it gets. The above shows the view from about three-quarters of the way there. 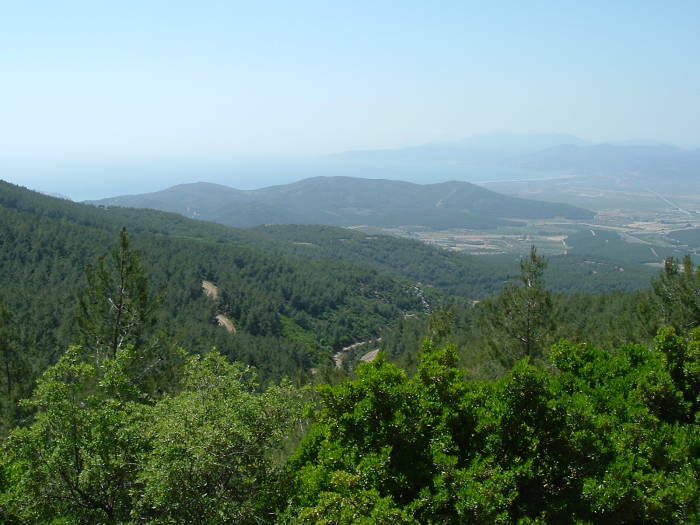 It is looking north-west toward the Aegean coast north of Kuşadası. Before long you will arrive at the entrance. 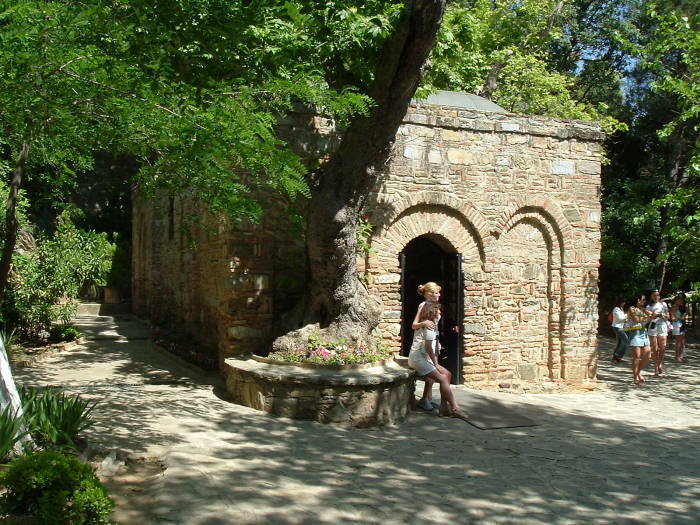 Once you pass the offices, snack bar, and souvenir stand, the first historical site is the large church from the 300s that was discovered at the site. 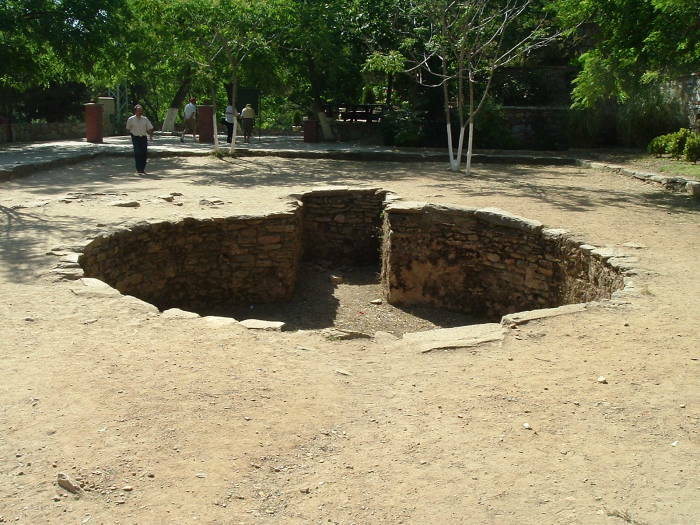 The classic keyhole-shaped baptismal pool is enormous. It's much larger than the baptismal pool in the Basilica of the Virgin Mary in Ephesus. This wasn't just some minor mountain chapel. 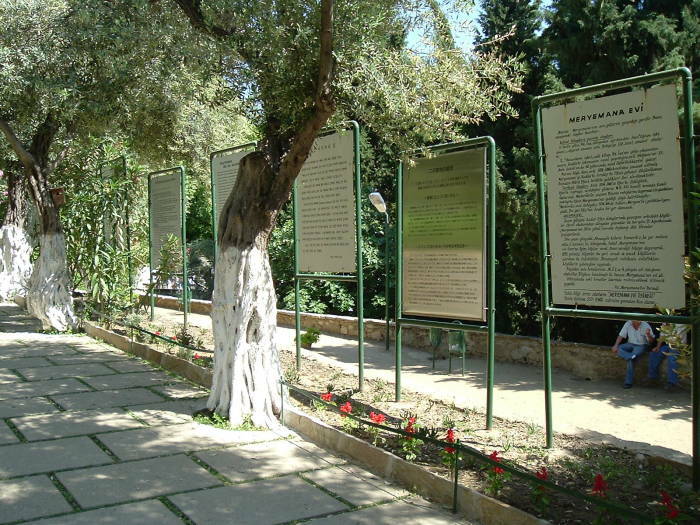 Signs in several languages explain the history — English, Turkish, Greek, Russian, French, Spanish, Italian, and Arabic. Beyond the signs you find a small version of the statue you passed at the bottom of the mountain. Immediately beyond it is an area used as an outdoor chapel for frequent services. And beyond that is the house, visible through the trees at the right. The red painted line around the current structure indicates the level of the 300 AD structure that was standing at its discovery in 1891. It extends around the sides of the current structure, although it was left off the front in the interest of appearance. Some days you will encounter a large and noisy group of foreign visitors on a bus out of Kuşadası, where they have briefly stopped on a cruise ship. But usually the largest percentage of visitors, by far, is Turks. Some will have come from distant parts of Turkey to visit. A good spring close to a home would be a requirement back in those days. The spring is just below the house. 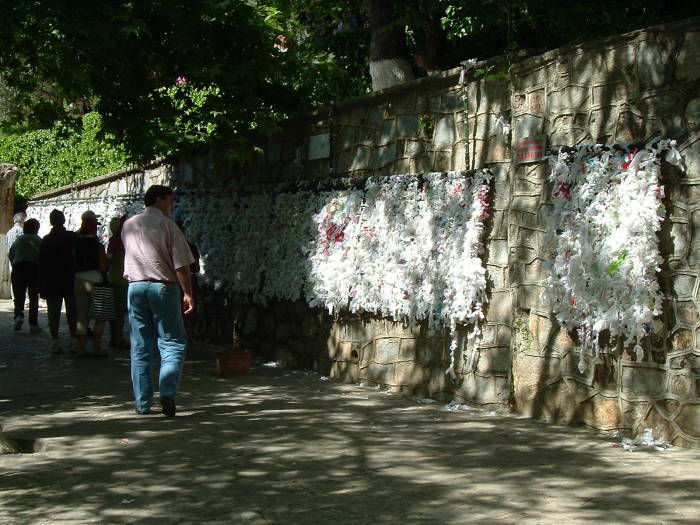 People write the subjects of prayers to ribbons and tie them to lattice work just below the house. If you walked up, you might as well continue to the summit of Aladağ (Spotted Mountain) after your visit to the house site. A gravel lane branching off the paved road just outside the entrance leads to a radio relay station at the peak.